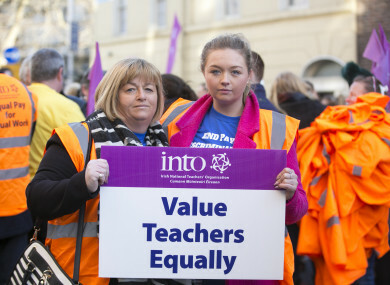 Pictured Niamh Walsh with her daughter teacher Monica Walsh at a protest in March 2018. THE EUROPEAN COURT OF Justice has ruled that Ireland’s two-tier pay system for teachers is not an act of age discrimination. Two INTO backed teachers Tomás Horgan and Claire Keegan, made a claim to the ECJ based on a question that was referred on from the Irish Labour Court. It’s based on cost saving measures that were made by making cuts to teachers’ pay, among other public servants. For example, teachers appointed before 2011 were paid €34,484, and those appointed after 1 January 2011 start on a salary of €36,318. A difference of €1,000 – €3,000 continues throughout the teachers’ pay scale. You can view the figures from the INTO here. “…it is also common ground that irrespective of the year of recruitment, both the teachers recruited after 1 January 2011 and those recruited before that date were on average 25 years of age or under. The INTO said that it the ruling was “a bitter disappointment”. The case returns to the Labour Court where the claimants, supported by INTO, will reply in detail to the ECJ responses and will ask the Labour Court “to find that what looks on its face like age-linked discrimination is exactly that”. To impose a salary cut on these entrants means in reality that younger teachers were paid less at start of career than older teachers had been, a disadvantage which persists across the career resulting in a substantial differential in career earnings. Email “European Court rules that two-tier teacher pay scale isn't age discrimination”. Feedback on “European Court rules that two-tier teacher pay scale isn't age discrimination”.